Most economists would not admit in public that they are anything less than virtuosos at what they do. But I am not "most economists". So I'll admit it: in many ways I am not that great of an economist. The part that gives me trouble is not the math - there's nothing in most econ papers that I didn't do as a sophomore in undergrad. The part that gives me trouble is the intuition. Applied math disciplines, like physics and economics, are about 30% math skill and 70% intuition. History bears this out. 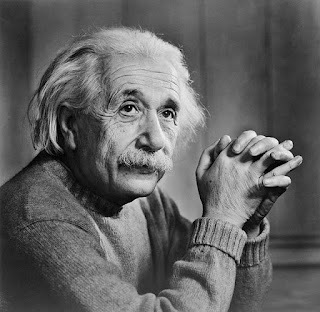 Einstein, generally considered the greatest physicist of the 20th century, was no great mathematician; he needed help from Poincare, Hilbert, Minkowski, and other pure math people to work out some of the trickier aspects of relativity. But where Poincare, for example, failed to intregrate the math of special relativity (which he invented) into the rest of physics theory, Einstein's unmatched intuition allowed him to do this. Physics was always my best academic subject by far, because I had that knack for intuition. Friends of mine who were absolutely brilliant at math (including one who published math papers in high school and now teaches at Harvard) would try taking physics classes with me, and I would end up helping them, because for some reason I could "think like a physicist" in way that allowed me to circumvent the need for tedious calculations. For example, what's the force on a charged particle that is near to a charged sheet? If you start from the math, you integrate the force from all elements of the charged sheet; it takes a few minutes of your time. But if you understand intuitively how electric fields work, you can use something called Gauss' Law to find the answer instantly; no time-wasting integral needed. If you can switch rapidly back and forth between this "symmetry" approach and the standard "furious calculation" approach as needed, you'll do well on physics tests and theory research too. Anyway, to make a long story short, this approach never worked as well for me in economics. There are some things I seem to have good intuition for, like Bellman equations and search models. There are some things I didn't have any intuition for when I started, but got more with practice (game theory). And then there are some things that have stubbornly resisted my attempts to understand them instinctively. Much of macroeconomics falls under this heading. Reading most macro papers, I can follow the math, but I have no idea why the modeler chose to do things the way they did, and I wouldn't have been able to invent the same model if someone had told me to model the same phenomenon. This is true not only for original, breakthrough stuff, but for pedestrian models that are small tweaks on existing models. I've wondered why this is, and I've concluded that it's mostly because there are few bedrock principles I can go back to. Example: I was sitting around with an economist friend and spinning a story about why financial market failures might make people stop working during recessions. He furrowed his brow and asked me "But how can that make people work more during booms?" To which I had no answer. It hadn't occurred to me, until that moment, that increased labor supply (or increased capital usage) was necessary for a boom. That's a simple concept, and it was built into all the models I had studied and worked through in class, but the fact of it had eluded me! So of course I answered "Well, maybe there are no such things as 'booms', maybe what we see as 'booms' are just a normal-functioning economy, and any downward deviation in employment or growth is just a market failure." And of course, it's possible to build models like that, and maybe it's even true! But still, without understanding and accepting the idea that labor supply exceeds its sustainable long-term level during a "boom," it's hard to understand most of the popular business cycle models on a deep, intuitive level, because most of them attempt to explain the "phenomenon" of fluctuations of output and unemployment around a trend. Another example is labor market clearing. I never really managed to pound into my head the notion that labor markets clear (because hey, unemployment exists!). And of course there are models in which labor markets don't clear, but these models are generally built by starting with a model in which labor markets clear, and then adding a friction (e.g. sticky wages) to stop them from clearing. I would have had a hard time making such models. And, perhaps of more immediate importance, I sometimes forgot the labor market clearing condition on tests! I'd be sitting there thinking "How do I close this system of equations?" for 5 or 10 minutes before I slapped my head and thought "Duh, labor market clearing!" This is in contrast to physics, where I'd whip out Gauss' Law pretty much instantly. This is the kind of dumbness that mathematical sophistication can't prevent; you can't solve a system of equations until you know which equations to write down! Now, anyway, what I could do would be to say "Actually, it's not my fault, it's the discipline's fault. The economics Overmind has pounded a bunch of notions into people's heads that aren't really true; the only reason good macroeconomists can make their models so easily is that they share the same bunch of wrong assumptions." That would fit with the irreverent, pugnacious tone of this blog. But is isn't really true. A good economist - especially a macroeconomist - can master a form of doublethink. "I know this assumption isn't true," (s)he thinks, "but to make this model I need to act like I believe it's true." This is a trick I haven't really mastered, and it probably has more to do with my lack of an undergrad economics education than with the wholesale brainwashing of the entire econ profession. In physics, you don't have to use doublethink, because the laws and principles you use really are true; even if you neglect friction, for example, you've probably got a good description of the motion of a hockey puck or a satellite. Econ is more about building toy worlds that don't exist - can't exist - anywhere, just to clarify your thinking. This is a mental skill that is probably best learned at age 18, and I was 26 when I started learning econ. So, for example, I wouldn't easily be able to write anything like Larry Summers' critique of RBC models. Summers has the intuition to understand quickly, but at a very deep level, how these toy economies work and what makes them tick. I don't. And so my critique of RBC would be something more along the lines of "What are you even talking about?!" Which makes more for a cathartic blog rant than a thoughtful academic rebuttal. Anyway, fortunately for me, I discovered (late in the game) that I have a much better intuition for finance theory (and, increasingly, for game theory!) than for macro. You don't always have to use doublethink. The CAPM might be an excellent description of risk under certain conditions. For worlds where only a certain kind of frequent, routine change occurs, Black-Scholes is probably a great model of option value. And the decision problems of single agents trying to maximize simple utility functions in complex environments are a lot easier for my brain to work with. So I think I made the right move, in terms of transitioning toward a field where the mental techniques I learned in my undergrad physics classes have a better chance of succeeding. This actually something that my math and econ professors get in arguments about. My math professor thinks since the assumptions economists make aren't really true, then the whole model can't have much use. But as you said, economists make toy economies to show a simplified way of how something works in the real world. George Mason isn't very math intensive at all. But part of what makes Brad Delong such a great economist is his ability to see both. "My math professor thinks since the assumptions economists make aren't really true, then the whole model can't have much use. " This professor has missed the entire difference between math and science. No, the math prof knows that you can prove anything from a falsehood. And has probably observed that empiricism is only a small part of economics. Min - That's exactly what he has said. Speaking of Summers and finance, look for his "Ketchup Economics" paper on the web... Absolutly briliant! With this is mind why did you transition over? Why not stay and do a physics PhD? Request for your next blog post: can you go into this part a little more? "(Side note: Another problem I have when making macro models is that I can't really decide which stylized facts I want to try to explain, mainly because I don't really believe in time-series econometrics, and hence I don't believe in most stylized facts. This is a somewhat different issue, though.)" I've read Taleb's critiques, I'm wondering if yours are similar. I was thinking the same. Please write a little bit more about why you don't "believe" in time-series econometrics. I think it deserves some explanation. Agreed here. This throw-away line deserves more elucidation. I don't really understand why you have a "better intuition for finance theory" than for economics, given your self-diagnosis. Black-Scholes is in fact a great option model, despite the fact that every one of its assumptions is demonstrably wrong. Why do you add the caveat about a "a certain kind of frequent, routine change"? The beauty of Black-Scholes is that it remains a great model even when its assumptions are most egregiously violated. It was a great model on October 19 1987, for example - good luck recalibrating your all-singing, all-dancing SV jump-diffusion model in real time in that environment. But the point is, to use B-S you have to suspend your disbelief, its strengths are the intuition it gives you into how your option will change when the market environment changes (and, not to be despise, how the value of your *hedged portfolio* will change), it is an absurd oversimplification, it has exactly the right number of free parameters etc. Isn't that the same as the economic models you claim to have no intuition for? There is only one important difference between economic and financial models: in economics, it is possible for two practitioners to hold mutually incompatible beliefs for years or decades; there is not sufficient data for one to prove the other wrong conclusively. That problem does not arise in finance; if you are wrong, you will blow up and win a Darwin award. "There is only one important difference between economic and financial models: in economics, it is possible for two practitioners to hold mutually incompatible beliefs for years or decades; there is not sufficient data for one to prove the other wrong conclusively. That problem does not arise in finance; if you are wrong, you will blow up and win a Darwin award." Maybe, or maybe not. Last I heard, a number of major financial institutions survived and prospered. Isn't that the same as the economic models you claim to have no intuition for? Good question, but no, not really. The empirical problems you mention later in this comment mean that in finance we can have a good idea of how right a set of assumptions is; in macro we often don't even know how right or wrong an assumption is. See the difference? They were lousy traders. Having a great theory and understanding financial markets are two worlds apart. Stick with Finance and learn to understand market behavior (if it is even possible. Our four best living economists are Buffett, Munger, Soros, and Kahneman. What does math have to do with it? Is reflexivity necessarily in contradiction to the concept of equilibrium? I'm not able to say, but Soros' statement looks like the whole point anyway. Economics does not deal with matter, it deals with humans. And those humans have something to gain or to lose depending of the actions they take in the economy. So, as soon as someone is able to understand how the economy works, it will use it to its advantage, and make the economy works a bit differently. If I'm not too wrong, that's Lucas' critique. But Lucas and his followers did not extract all the implications of that critique. It is no use to introduce humans in economic models. Because if you succeed in making a better model, those same humans will learn it and use it to their advantage, making the economy work differently again, and making the model obsolete. In other words, you may only build descriptive economic models, and not predictive models. Description if fundamental for understanding, but it should not be mistaken for a prediction and policy-optimization tool. As a consequence, econometrics is worthless (either time-series or standard), and it's enough to rely on simple statistics. And maths is not so useful either. Soros is alive and available to answer your questions. Buffett and Munger do answer my letters. On your blog you ask,"And would that in turn suggest that the root of the problems in the other countries is the Euro, rather than deficits?" Read Martin Jacomb's several essays for the Financial Times. He does an excellent job of answering this question. Not that it matters a whit, but I am of the school of thought that the private agreement is that the Euro is the first step to a federal Europe and that the reason it hasn't been dropped is an unwillingness to give up on that dream. Nothing else makes sense. It is not possible for a currency union to work, absent gov't transfer payments and other active steps to spread the wealth. The Fed Gov't pays doctors the same in New York as it does in South Dakota. This is why the US works, to the extent it does anymore. How can a model like B-S be useful, when all of it's underlying assumptions are false. The only answer I can come up with is that the falseness doesn't matter very much in context. I.E. the assumptions give an approximation of reality that is imperfect, but close enough to not lead one too far astray. Either that or the math output is relatively insensitive to errors of the input. That is the difference with macro models. In macro, the falseness of the assumptions is profoundly meaningful. That's why macro models utterly fail at predicting big events like the crisis of 2008. But when you come up with something foolish and useless, like RBCT, macro-economists cling to it like barnacles. The model is revered and reality is wrong. I don't think you're problem is a lack of intuition. It's that you are too committed to reality. Bear in mind that all that beautiful financial math was in fact tested to failure four years ago and failed spectacularly. In my business, building things, that rubble heap would have been roped off and very carefully studied. Engineers would have been prosecuted. Instead the combined Fed and Treasury have suspended the law for finance and swept it all under the rug. Now they allow our main financial institutions to "mark to model" rather than "mark to market". That the markets behave like the models is a tautology, they're now the same thing, and the Fed can patch any holes models produce with unlimited fiat money and does not hesitate to do so for finance (not so generous with the rest of us) to prop up the illusion that we still have markets. Darwinism has been abandoned in finance even as it has become the preferred ideology for all things outside. It took 29 trillion of fiat liquidity to make the financial models that drive electronic trading survive in the crisis (http://www.levyinstitute.org/pubs/ppb_123.pdf) and with proper mark to market accounting there isn't a bank in the US that's solvent, there may not be one with over several billion in capital in the world that can show honest books. Instead of turfing out the buffoons who dynamited the economy, the Fed/Treasury have effectively said "who could have known?" its all so complicated, but don't worry, if you blow it up again we'll stuff it full of money again. But if you pay for research and development, or education, or infrastructure, that will by hyper-inflationary as if the 29t hadn't preserved a super bubble in assets. "Bear in mind that all that beautiful financial math was in fact tested to failure four years ago "
Not really. Financial ”economics” is mainly about the relative prices between different financial assets, and those relative prices will generally hold due to arbitrage opportunities. If financial economists couldn’t derive the general price level of financial assets from fundamentals because it is hard – that would be one thing. However, since they generally are not even trying to do that it is pretty absurd to even categorize financial economics as economics. I think it would fit better under business administration. An economists who for one or another reason wanted to include something about the financial markets in their economic model would, generally, not even look at the literature in financial economics – since (s)he wouldn´t expect to find anything relevant for economics there. It all becomes easier once you take these "toy worlds" as possible ones that would exist given different 1. Historical events, 2. Basic human behavior 3. Technological environments. The thing is that some things dont matter in aggregate as simple rules and desires overcome coordination costs. "toy worlds" matter as saying, for example, imagine of a world where people had four arms, is it weird to expect a hammer to have a different shape?, go back, does having two hands matter?. Silly, but still makes some sense to me. "This is a trick I haven't really mastered, and it probably has more to do with my lack of an undergrad economics education than with the wholesale brainwashing of the entire econ profession." Having an undergrad economics degree doesn't help, trust me. The stuff that I learned from undergrad macro are Keynesian theories and the standard IS-LM model. None of these are built on fansy yet unrealistic assumptions. When I first started my postgraduate degree in economics, I was startled to realise how remotely the RBC/DSGE models are connected to the macroeconomics that I used to know. I felt being fooled into doing a PhD in macro because of my econ UG degree. I'll add that your physics intuition might be useful in your economics. There's an even simpler argument than Gauss' law for the invariance of the electric field of an infinite charged sheet. The force from each infinitesimal solid angle element is distance invariant ( proportional to r^2 X 1/r^2 -- the same as Newton's argument for the absence of a gravitational field inside a hollow sphere of matter), so the force from the entire 2pi solid angle must be distance invariant. In many physics arguments, you'll distinguish first order effects from second order effects and worry about all of the former before you begin to consider the latter. I suspect that something similar must be true in macroeconomics. A first order effect might be the Keynesian intuition that income = spending. Cut spending across the macroeconomy and incomes will fall, as is happening in Europe today and as seems likely will happen in the US in the future. Second order effects, such as business or bond market confidence, are swamped by the first order effects. Or so this physicist's intuition suggests. There's an even simpler argument than Gauss' law for the invariance of the electric field of an infinite charged sheet. True! But that one just gets you distance invariance, without the constant. Actually, there's an even simpler argument that shows the distance invariance just from symmetry, which Savas Dimopolous told us in class, but I can't remember what it was. I think on a test when I got the question I used Gauss' Law. Maybe that was an AP test? Further to my last, a theory of the behavior of physical objects that performed as poorly in a predictive test as the mainstream models did in the 2000s could never get published in a reputable journal. Turn your analytical skills on the assumptions. We need better economic theory paradigms. So, would you say you have 'noahpinion' on the RBC model? I just finally finished it. Really it's an awesome piece; you may find it profoundly valuable. Let me say that I like your writing and your blog very much. But I worry that you feel you have an intuition for finance without (unless I am wrong) actually having "done" any finance. And when I say that, I mean actually having had to make investment or pricing or underwriting decisions of real consequence. This is not reverse snobbery. I came back to academic finance after a long career doing just that, and the CAPM (and the factor models) just makes me scream. Its not that it is slightly wrong, but that to my intuition everything it teaches, every insight it gives is exactly wrong. And of course its insights don't just depend on its assumptions, its insights are its assumptions. Can I ask that if you teach finance, teach the assumptions first and turn your critical mind (and you clearly have one) to what conclusions or insight we should receive from the standard models of finance given their assumptions are wrong. Consider whether the CAPM is a good model only to the extent that it tells us what the world cannot be like. Good point! It's a learning process. Great. Then I am sure that this will only be temporary - " You don't always have to use doublethink. The CAPM might be an excellent description of risk under certain conditions." A good way to learn Macroeconomics is to work out the 2nd edition of a book like Macroeconomics in Emerging Markets, by Peter Montiel (CUP, 2011). I am neither the author nor the publisher nor someone marketing the textbook. I am just a person that read the book and found it to be illuminating. HI Noah. I agree. With what I'm going through right now, I can say that I'm becoming a better economist already. Application is the key! My latest blog post on involuntary unemployment as described by John Maynard Keynes. It should be obvious that Noah has noticed what an awful lot of sensible people, including many successful investors and businessmen, have long noticed, that modern macro-economics is as useless and baseless as modern literary criticism. There's a reason he can't develop an economic intuition that aligns with the theory, the theory is too bogus. Noah was just looking for a polite and self deprecating way of saying this. "Econ is more about building toy worlds that don't exist - can't exist - anywhere, just to clarify your thinking." And right there is the single biggest problem with academic economics today. Aziz makes a good point here. Models only reflect a small portion of reality, and omit factors without regard to their significance. As a result, economic models tend to fail in much the same way that weather models fail: The information you don't know changes in importance from time to time. If you had a classical physics model that predicted certain acceleration "assuming no outside forces", the model would always be wrong in some way. In this case, I think your intuition is not the problem. The problem is that you have the physics mindset that there is a correct answer. btw, i just saw your tagline "Don't sell yourself short; buy put options." well, it depends on whether you want to be long volatility or not. I love this blog! You always write clearly and elegantly about ideas that I very often have also had before but was too lazy and dumb to flesh out... I agree completely about math versus intuition, and I wish I had understood this much earlier instead of wasting time reading about real analysis and topology. Prospective students: intuition is everything. Don't believe those who say that you need to become a math zombie. What you really need to do is interpret every equation in terms of economic decisions or equilibrium conditions. It is so much more important to understand why Lagrange multipliers are shadow prices than to solve a maximization problem. Unfortunately some economists use mathematics to satisfy a fetish instead of using it as a clarifying tool. Einstein dixit: "Since the mathematicians have invaded the theory of relativity, I do not understand it myself anymore." BTW Noah you need to explain in another post what do you mean exactly when you say that you don't believe in time-series Econometrics. I have in my mind a point formulating about the models and equilibrium and the inability of the models to anticipate shocks - like the bursting of the real estate bubble. All along I think I knew that the current conditions of the last two bubbles (the dot com and housing bubbles) were inherently unsustainable. The intuition I used was that I considered what the earnings were that could support a particular activity and then I considered how leveraged the particular asset was. Both these variables pointed to the collapse of the investment in the particular asset. I believe this is why the current hysteria about the federal debt is unwarranted because a debt of 100 percent of GDP is not inherently over-leveraged with respect to our ability to pay (by definition a small percentage of GDP). I believe this type of thinking could point the way to a theory of collapse (busts in the capitalist system) but I fear I am too old now to really have time to pursue this line of inquiry (I am now 48). Yes, you have a (fairly obvious) intuition but they are talking about something else. What they mean is the ability to "doublethink" as Noah calls it. The capacity to direct your intuition subject to the constraints of the mathematical models. It is not that math is useless. The issue is that some economists are able to do the math but find it more challenging to extract economic meaning ("intuition") from the equations. I would contend that the math is pointless unless the model has a sound foundation in reality. I think you are having difficulties with your intuition because the world of macroeconomics is very complex. In reality the world economy from the macro level is a complex multi-dimensional system with non-linear responses in different parts of the space. I believe a more comprehensive mathematical model might be possible and could probably be refined to correctness. However, the world of macroeconomics is dominated now by experts who have carved out their niche for certain aspects or limiting conditions of interest. I guess we might be able to build this model and have a computer run it then analyze the results after the fact - much like a particle accelerator. Physicists are able to get away with perfectly spherical cows. Models don't have to be particularly grounded in reality as long as the deviation from reality can be shown (empirically or by perturbation analysis or something) to be close enough to reality for practical purposes. Let's not continue repeating the mantra that simplification in economic models is just like what physicists do. It is not. And Noah explains why in this very post. I think simplification is useful in Economics too but it works different than in Physics. Economists need to explain this better. Failure to do so is the reason why 99.99% of non-economists (even smart people from other disciplines) think Economics is a hoax. Another possible explanation for the 99.99% (78.5 % of statistics are invented on the spot) is that economics is a hoax. Can you present any evidence which strongly suggests otherwise ? notyourbusiness: It's not just what physicists do, but it is at least somewhat similar. My point is merely that forcing models to be too grounded in reality isn't particularly necessary for doing good research. There are problems with economics, but they lie in the fine details, not in using false assumptions. notyourbusiness: seconded. Far as I can tell, most economic "models" would be better described as "narratives" or something. They're mostly about giving people's subconscious something to play association games with. That wouldn't be a problem, except that these days scientists seem to use the term "model" in a fairly strict sense that's all about predictivity. The economics use of the term is anachronistic at best; at worst it's blatant physics envy. I don't care what you say. I say it's not your fault, it's the disciplines fault. I think your intuition is sound. I might add that I have no trouble with econ intuition (including finding math errors in early drafts of the work of others without doing the math). I moved into econ when I was 24 (although I had casually talked about it with my friends Brad DeLong and Andrei Shleifer before). I think this is my problem not yours. Take your first example. If you look at the time series of US GDP you see a trend with occasional recessions (plus WWII and the great depression). There is no evidence that expansions have a natural life span. Also the recessions and normal times dichotomy is how most non economists see the economy (because it is how the economy is). Only thorough brain washing can convince people that there just must be booms where output is unsustaianly high. OK bak to work figuring out what absurd assumption to make so that labor supply is high during the unsustanable boom in the model (really it's easy Extreme abuse of the representative agent assumption). I think it has nothing to do with reality and I just can't quit it. Need Market Samples for your Surveys? Get samples for marketing research instantly at surveytool.com. Make educated decisions with effective market samples NOW!.